This document will show you how to build plain-text (tab- or commma-separated) files that can be used to make maps with GPS Visualizer. It's actually very easy to get started, but there are some powerful features that you might not be aware of. After reading this, you should have a better understanding of what GPS Visualizer can do and how you can take advantage of it. For most of the examples on this page, we've created very simple JPEG maps. They're not very fancy, but this document isn't about spectacular maps, it's about massaging data into a mappable format. Unless otherwise noted, all the information here also applies to creating Google Maps, Google Earth files, etc. Once you have a nice, clean data file, you can do anything you want with it. All you really need is a collection of coordinates, or even just one pair of coordinates; adding a "name" to each point is not necessary, but very helpful (and it lets GPS Visualizer know that you're uploading waypoints rather than a sequence of trackpoints). 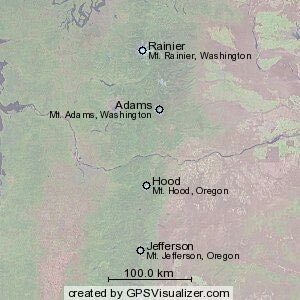 For this example, we'll use the tallest Cascade Range volcanoes in southern Washington and Northern Oregon. The easiest way to organize your data is using a spreadsheet, like Microsoft Excel. On the left, below, is a screen shot of an Excel worksheet, and on the right is the same data in simple, comma-separated format. To make a map from data like this, just cut and paste the data from Excel or your text editor into the text area on GPS Visualizer's map form. (When you copy data from Excel, it gets pasted with tabs, which will work fine but might look strange.) If you prefer, you can also upload the Excel file to GPS Visualizer. For now, let's use the JPEG/PNG/SVG map form, with the output format set to JPEG and the size set to 300 for simplicity's sake. (Go ahead and try it using the data in the box above.) After clicking the "Draw a map" button, the resulting graphic should look similar to the map on the left. Here's the most important thing that can be emphasized about creating plain-text data files for GPS Visualizer: Having a sensible "header row" above your data is VERY important. The order of the fields is NOT important. Spaces between fields and capitalization of the header row aren't important either. So "name,latitude,longitude" is identical to "NAME, latitude , Longitude." These "not important" factors are a big part of what makes this program so powerful: chances are, if a human could read your data and make sense of it, so can GPS Visualizer. Include as many or as few fields as you want; as long as a waypoint contains information that might let you plot it on a map, GPS Visualizer will try. Now, let's add a "description" field to each point (usually abbreviated as "desc"). For now, we'll put the full name of the mountain, along with the state it's in. So Rainier's description is "Mount Rainier, Washington." We'll also add a field that contains the height of each mountain. We'll call it "alt" to keep it short, but you could also use "altitude" or "elevation." NOTE: if no units are specified, GPS Visualizer will think your numbers are metric (meters for elevation, km/h for speed, etc. ); but, in this example, we have our elevation data in feet, so we need to call the field "alt (feet)" or "alt (ft)". There's something very important to notice about this comma-separated data: the items in the "desc" column MUST be enclosed in quotes because there is a comma inside each description. Without the quotes, everything would be shifted back one column, and the altitude of the first two points would be listed as "Washington"! Voila. If you think the text is too small, you can always increase the "text size" box in the map form. (This will only affect JPEG/PNG and SVG maps, though, not Google Maps or Google Earth.) Also, if you don't mind dealing with SVG files, you might try that, as they look much cleaner than JPEGs. The nice thing about storing your raw data in a spreadsheet like Excel is that you can manipulate the fields as needed. This is especially helpful for the description field. Let's say we want to display the height of each mountain on the map. All we have to do is concoct a simple Excel formula that reads the "alt" field and adds it to the end of the existing "desc" field. Since the column with the formulas in it will need to be called "desc" in order for GPS Visualizer to recognize it, we'll rename the original "desc" column to "full name," which GPS Visualizer will ignore. In the screen shot below, you can see the formula in cell C2 laid bare for the world to see; in cells C3 through C5, the results of the formula are visible. Maybe we should have just put the altitude by itself in the description field; it's getting a little messy. Oh well, there's no harm in experimenting. Note that if your output format supports HTML in waypoint names or descriptions (i.e., you are creating a Google Map or Google Earth KML file) you can build descriptions that contain HTML formatting, which can be very, very useful. For example, you can include line breaks via the <BR> tag; in fact, you could conceivably include an entire table of information in the description of each point. Each of your points can have its own color, defined by a "color" field. In our example data, we'll assign red to peaks over 14,000 feet high, green to peaks that are at least 11,000 feet, and blue to the rest. Colors can be either "named" HTML color values (blue, green, red, black, fuchsia, olive, skyblue, papayawhip, etc.) or hex-formatted RGB values (#0000FF, #82B3CE, etc.). And yes, "papayawhip" is really a recognized HTML color. Now we're going to turn away from those simple JPEG maps for a moment, because in JPEG, PNG, and SVG maps, you have no control over what kind of marker ("symbol") appears for each waypoint; it's always a circle. In Google Maps and Google Earth, however, you can use a different marker style, either for all points or each point individually. So, let's make a Google Map using triangles and squares. 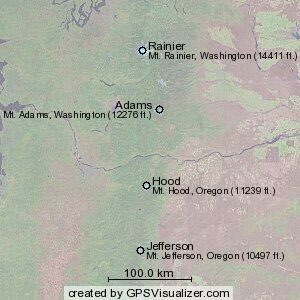 We'll say that triangles represent volcanoes that have erupted in historic time (Rainier & Hood), and squares are volcanoes that have been dormant longer (Adams & Jefferson). Google Earth makes it very easy to incorporate custom icons into your maps: all you need to supply is the URL of the icon graphic (even photograph thumbnails will work), and GE will take care of the rest. Google Earth can even colorize them if you supply a "color" field. When making both Google Maps and Google Earth files, GPS Visualizer lets you create "invisible" waypoints by specifying "no icon" or "none" in the symbol field. This could be useful if you want to put a visible label on a track in Google Earth (something GE does not normally allow), or to put any sort of label on a map without a specific icon attached to it. Using the "quantitative data" input form, you can have GPS Visualizer resize or colorize your waypoints based on a field (or fields) of your choice. It's not hard to do, but this feature is important enough to warrant its own tutorial. It's possible to specify the location of a waypoint using information other than coordinates: address, city, state, ZIP code, country, airport code, etc. NOTE: If your entire data file is a collection of addresses, you will find it MUCH easier and more efficient in the long run to use GPS Visualizer's Batch Geocoder to add coordinates to your points before proceeding; then you can skip this section altogether. The resulting map is just as you'd expect: a yellow pin on Seattle, and a yellow airport icon just northeast of Portland (at the location of PDX, Portland's airport). If you want to retrieve the coordinates of points for which you don't know the latitude and longitude, send your data through GPS Visualizer's geocoding utilities rather than the map form. This is helpful because then, in the future, you can format those rows the same as the rest, and GPS Visualizer won't have to work so hard to locate your waypoints. Entering an address or a city and state to find a location is far from an exact science. When you enter an address in the United States, GPS Visualizer first attempts to find it in a local database containing geocoding information from the U.S. Census Bureau; this database is not 100% accurate, and you may find addresses plotted on the wrong side of the street or worse. C'est la vie. If the Census database doesn't work, the Google and/or Mapquest geocoding Web services are consulted. But sometimes, it's still not right. When that happens, you may have to enter the coordinates into your file by hand. If you include the URL of an image in a waypoint's "thumbnail" field when creating a Google Map, it will show up when you mouse-over the waypoint marker, and will also appear in the info window that appears when you click on the marker. The thumbnails will be displayed at their natural size unless you also supply a "thumbnail_width" value (in pixels). If you include an image's URL in the "photo" field, that image will appear full-size in the marker's info window. (If there is also a thumbnail specified, the thumbnail will NOT appear in the info window.) Use two numbers in the "photo_size" field to set the displayed size of the image (e.g., "400x300"). You can see an example of a photo map here. Here's a list of the fields that are important in terms of how GPS Visualizer handles your waypoints. Alternate names are separated by slashes; for example, you can specify latitude with "lat" or "latitude." name the name of a point, as displayed on the map; use "-" for no name. In Google Maps and Google Earth, the name is used as the "mouseover" text for the marker. latitude/lat see note under "longitude"
label Google Maps only; puts a "permanent" label on the map rather than just a tooltip. label_color Google Maps or Google Earth only; sets the color of a marker's permanent label on the map. label_scale Google Earth only; sets the size for a marker's label on the map, as a percentage/proportion of the "normal" size. shortdesc Google Maps or Google Earth only; if you have your Google Map generate a marker list that includes descriptions, the "shortdesc", if it exists, will be used in place of the normal "desc" in the list. In Google Earth, the short description will go in the KML <snippet> tag, which is displayed in GE's sidebar. folder Google Maps (with a "marker list") & Google Earth only; you can create collapsible/hideable folders of waypoints and/or tracks if you provide the name of a folder. In Google Earth, you can go one level deeper by separating folders and subfolders by backslashes; for example, you could use "Campgrounds\Public" and "Campgrounds\Private", and a Campgrounds folder would be created, with Public and Private folders inside. Google Maps options These are included in a separate section because they're a bit esoteric and ONLY used with Google Maps. icon_size The size, in pixels, of a custom (remote) icon in "width,height" format; this will speed up processing of your map because GPS Visualizer doesn't have to go out and "inspect" the icon graphic. icon_offset Relative X and Y coordinates of the placement of the icon on the map (e.g., "10,10"). Numbers increase rightward and downward. icon_anchor Relative X and Y coordinates of the "anchor" of the marker's icon (e.g., "7,15"). Numbers increase rightward and downward. label_offset Relative offset, in X and Y pixels, of a marker's "permanent" label, (e.g., "2,-4). Numbers increase rightward and downward; overrides the global "label_offset" option. Frankly, it's often better to edit this manually after the map is created. label_left A value of "true" (or 1) causes a marker's label to appear on the left side of the icon instead of the right. label_centered A value of "true" (or 1) causes a marker's label to appear centered below the icon. z_index By default, Google Maps will display more southerly icons on top of northerly ones. 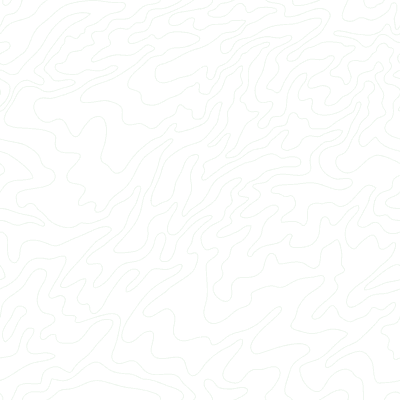 You can override this with a "z_index" parameter on some or all waypoints. thumbnail_width Sets the displayed width, in pixels, of the thumbnail graphic specified in the "thumbnail" field. photo_size Sets the displayed width and height, in pixels (e.g., "500x375"), of the image specified in the "photo" field that will be displayed in the info window. window_width Width, in pixels, of the info window that pops up when you click a point; overrides the global "info_window_width" option. no_window Set to "true" (or 1) you want a marker to not open a pop-up info window when you click on it. If you specify no_window, and your marker has a URL attached to it, clicking on the marker's icon will open that URL immediately. zoom_level Sets the Google zoom level (generally 0-19) for this marker when its name or icon is clicked in the marker list; only has an effect if a marker list exists and if gv_options['marker_list_options']['zoom'] is set to true. Overrides the global zoom_level setting in marker_list_options. nolist Set to "true" (or 1) you want to exclude a marker from an auto-generated marker list. (nolist:false has no effect on anything). dd "true" or "false"; adds or suppresses a "driving directions" form in the marker's info window; overrides the global "dd" option. dd_lon & dd_lat Sometimes, you want the driving directions for a point to end up at a slightly different location than the point itself; use dd_lat and dd_lon to supply coordinates for the driving directions form. Both coordinates must be present to have any effect. gv_track_number You can make a waypoint "belong" to a track so that when the track is hidden, the waypoint goes with it. Supply the number of a track (1 or greater).